Behold the power of the golden fork! 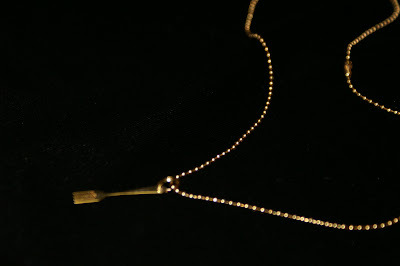 I received a gold fork in the mail from Laura Collins after participating in the Virtual Family dinner. The gold fork was a quite adorable little lapel pin, except I'm not really a pin kind of girl. I am, however, a creative kind of girl and I thought, "Hmmm...wouldn't that make a cute necklace..."
I easily removed the sticky pin part from the back of the fork and set about to make a hole in the fork by pounding a nail into it. I dented the first nail. I finally got out my dad's power drill, found the smallest bit I could, and drilled a hole in the fork. It took almost a minute of drilling to make the hole. Ed, you don't stand a chance against the golden fork. May that be a message to all sufferers and parents, friends and family. If you are interested in purchasing a necklace, please email me at carrierobin@comcast.net I will be working out costs and proceeds portions between me, Laura, and the National Eating Disorders Association, with the money earmarked for anorexia research. Ed doesn't stand a chance. You are definately right about that Carrie, if you continue to work as hard and be as persistent with your recovery as you were at turing that pin into a necklace, ED doesnt stand a chance! I just need my power drill to fight ED. Yes, great determination Carrie. Would be a great if you added some other tools, as charms, which you've used in your fight. A pen for writing, a book, beads in between for beading, on and on, your choice. Maybe a butterfly for transformation. Can you tell I like to gather things? Anyway, you are quite the warrior in how you tackled that pin to necklace project. You never gave up. Well done!